A visitor checks Yves Saint Laurent’s creations. 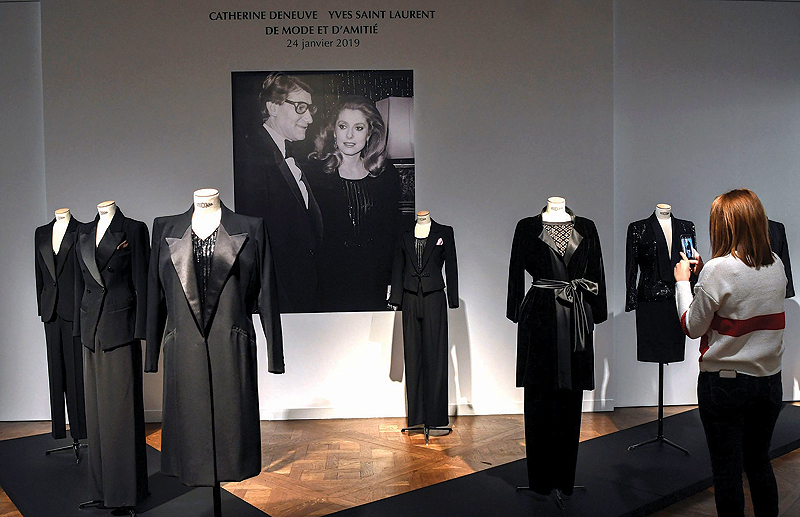 French screen legend Catherine Deneuve’s personal clothing collection designed by her friend Yves Saint Laurent will be auctioned in Paris next week. Deneuve, 75, is auctioning her clothing by the late fashion icon after selling her country home in northern France where she kept a wardrobe full of Saint Laurent items. “These are the designs of such a talented man who designed only to make women more beautiful,” Deneuve said in a message last October shared by the auction house Christie’s, which is handling the sale. Hundreds of items, including coats, dresses and accessories-some of them unique pieces designed for Deneuve-will be auctioned in an open sale on January 24 and online. One of the highlights of the auction is a beaded evening dress from a 1969 collection which she wore when meeting director Alfred Hitchcock in the same year, as well as an evening dress with pink ostrich feathers. Deneuve was often described as a muse for Saint Laurent and was a leading figure in the designer’s circle of glamorous female friends which included Princess Grace of Monaco, Wallis Simpson and Paloma Picasso. After meeting when she was only 22, Deneuve enjoyed an intense 40-year friendship with Saint Laurent until his death in 2008, telling him at a major exhibition of his work in 2002 that “my biggest ever love affair is you”.